Robin's adoption was finalized and he is loving his new life with a new mom and dad and dog brother! We are so happy for him. He was in foster care with his brother Batman (still adoptable) for almost a year. 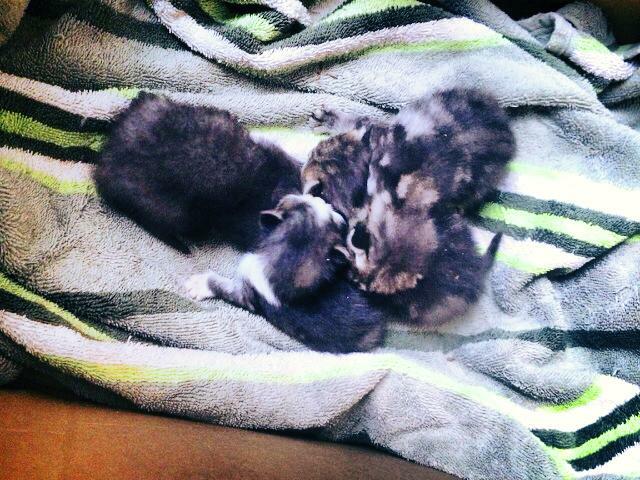 These four babies were orphaned on Saturday, 4/18 after their mom was hit by a car. They are only 7-10 days old. Foster mom is a vet tech and is tending to them around the clock with bottle feeding. We are so glad we had someone able to help them out in their greatest time of need. Despite receiving around the clock care, unfortunately two babies have passed away since we took them in. The other two are doing well and we hope they continue to grow stronger day by day. Suzi was found at a dumpster in Burlington NC on 4/14/15 and is under a year old and extremely pregnant. She visited the vet on her intake date and due to the fact she is nearly due to have her babies (we totally expected them over the weekend after she was rescued), we opted to not have her spayed and to allow her to give birth to her babies. Suzi is a very sweet girl with little spots of white on her. She is medium hair. Suzi has not had her babies yet. We believe she is actually about 6 weeks along which means we have anther 1-2 weeks of waiting. We discovered that she was being fed by some other people at the area where she was located and they had noticed she was pregnant the beginning of April. This sweet girl was abandoned about a year ago and the neighborhood where she roamed took care of feeding her. They contacted us to ask for help. Her rescuers got her fully vetted before surrendering her to Sparkle Cat Rescue. She is about 2-3 years old, spayed, up to date on vaccines and combo tested negative. She is a real sweetheart and safe and sound getting lots of love inside now until she finds a forever home that will appreciate her for the beautiful cat she is. Nala is being adopted and will go to her new home on May 23, 2015. Her new family is going to be out of town and rather than board her, it is best for her to wait until they are home to give her all the love she deserves! 4/12/15 Kittens getting ready for a road trip to Virginia to Forgotten Tails, Inc.! Four babies, about 2 weeks old, were surrendered to Burlington Animal Services with no mother to nurse them. BAS reached out to rescues in our network asking for bottle feeders until they could be picked up by Forgotten Tails in Virginia. Our VP and foster mama extraordinaire Cheryl stepped up and offered to bottle feed them. They stayed with her nearly a week and grew strong and healthy with around the clock feedings of KMR from the donations of our kind supporters. These kittens had come to our attention when one of our supporters messaged us on Facebook with concern about someone posting them on a yard sale site giving them away free. Much too young to be separated from each other and desperately needing proper medical attention and bottle feeding, I was relieved when I found out they had been surrendered. On 4/11/15, Forgotten Tails picked them up to take into their program for future adoption. MUNCHKIN was rescued in October 2014 by one of our supporters and on our waiting list for quite a while. In February 2015 we were able to get her into our program and get her the medical care she needed. 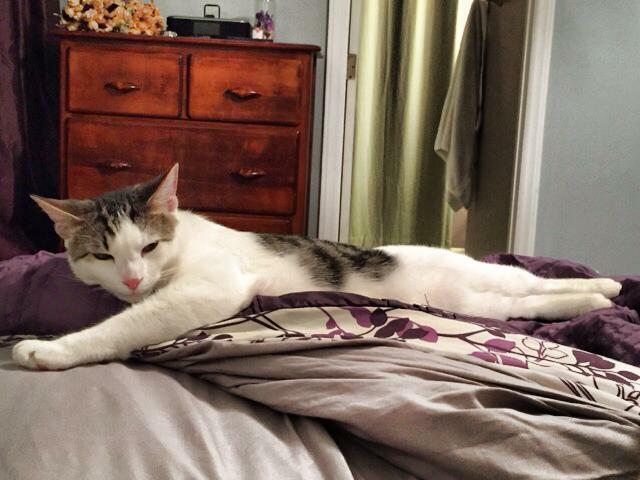 She was spayed, vaccinated and combo tested through Sparkle Cat Rescue. She found a loving family at our April 2015 adoption fair! She will be loved and is such a lucky girl. The first photo on the right is the day she was rescued. The photo on the right is the day she joined us. FINLEY was rescued by Sparkle Cat Rescue after we learned he was trapped inside a local business in Burlington. He had been picked up outside in the parking lot and carried into the store where he jumped out of the arms of the lady that had picked him up. He was trapped in the store for 3 nights, setting off alarms and was going to be trapped by Animal Control. We asked to put our own traps out and catch the cat (had no idea what he/she looked like, nor condition they were in). We figured the cat was not feral since it had been picked up from the parking lot. Overnight, Finley was trapped. We reported him as found to local animal control for a 72-hour hold period. He was an intact male, very malnourished and in rough shape. He was neutered at FCAP and lo and behold someone fell in love with him and wanted to adopt him. His adoption became final on Friday, April 10, 2015. A big thanks to our supporters for coming out to our first comedy show fundraiser, 'The Cat's Meow' on Thursday, April 9, 2015. We had a wonderful evening and lots of laughs with Trish Dunn and Herb McCandless, Jr.
Butterscotch joined his brother Gingersnap when he was adopted today! 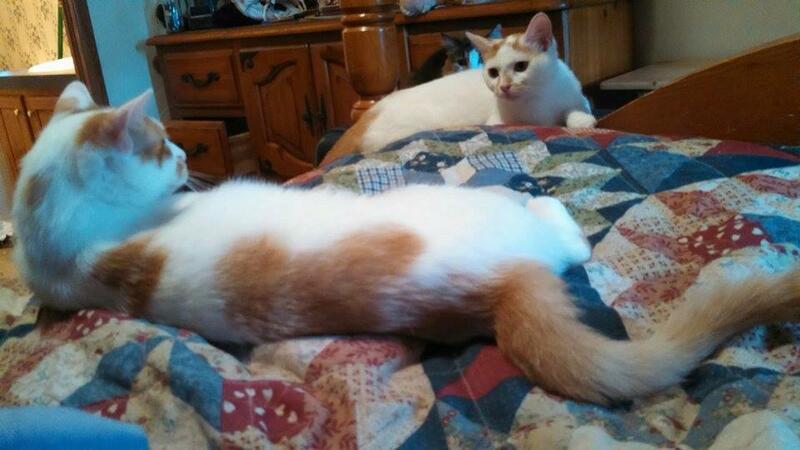 His brother had been adopted last month and mama decided to reunite these two brothers! We could not be happier! Photo on right from their young kitten days and photo below of them in their new home figuring out they really are going to be best buds again! Happy Tails! Butters and Ginger reunited 4/10/15!